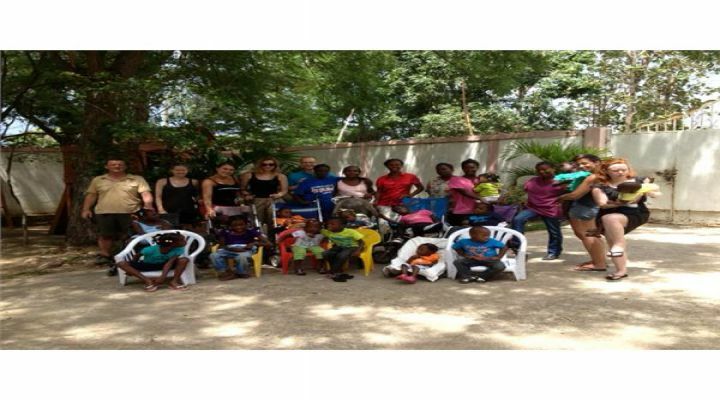 In May 2014, our team of 6 staff members from across Hammerson ventured to Haiti for 2 weeks to show their support for the Haiti Hospital Appeal. Since we joined forces with the Appeal, Hammerson's ongoing donations have gone towards the building costs of the maternity ward and cholera relief efforts. This year, with nearly £11,500 raised, plus the gift aid, our team were able to see first-hand, how far that money goes. With some of the funds Hammerson raised, the Appeal were able to buy nearly 500 banana tree roots. During their time in Haiti, our team loaded, unloaded, and then planted these trees on behalf of the Appeal. Other projects our team were asked to do whilst they were there were to build containers at wheel-chair height for patients to grow their own vegetables, help convert an old barn into a chicken coup and decorate a respite centre for the patients. Needless to say, our team could have used some respite themselves after these busy 2 weeks! To further support the appeal, we also sent a container which was funded by the Guernsey Overseas Aid Commission, who gave us a grant of about £40,000 to increase the amount of new solar panels and new batteries for the back up system which we'd donated. Then, as we had a bit of spare space we added some clothes donated by Primark which very much pleased the locals! The Swiss Paraplegic Foundation also sent over some medical equipment, including a new Urology machine, which was the first of its kind in North Haiti. We hope to continue our support for the Haiti Hospital Appeal for years to come and already we have people showing interest in being included in the next trip out. For more information on the Haiti Hospital Appeal please visit their homepage here.